Does State Law Require You to Support Your Aging Parent? Who is “required” to take care of your elderly parent? The following should not be considered legal advice. Always seek the council of an attorney to help with your particular situation. If you have aging parents, you may have wondered who will pay their bills if they are no longer able to. Filial Responsibility Laws where created in some states which pass the obligation of paying for the basic care and needs of an aging parent to their adult children. This law dates back to the early 1600’s English law known as the Elizabethan Poor Law. These Poor Laws as they were known, where created in a time of economic depression. The government raised taxes to help pay for the relief of the elderly, handicap and destitute. They also stated that children where responsible for the care of their unemployed parents and grandparents. It is said that the American colonies modeled their public assistance on the Elizabethan Poor Law. Currently, thirty states in the U.S. as well as Puerto Rico have passed these filial (due from a son or daughter) responsibility laws. In a nutshell, these filial support laws require adult children to financially support their parents if they are not able to take care of themselves or to cover unpaid medical bills, such as assisted living costs. This also includes food, clothing, shelter, and health care/medical needs of the parent. The following list contains states that have passed a form of this filial responsibility law and a link directly to their state statute, where possible. Click on the state to find more specific information about their filial law. According to the Miami Center for Estate Planning and Family Law, eleven out of the thirty states have never enforced their filial responsibility laws and most rarely put them into place. Each state provides guidelines to the court on how to rule according to a variety of factors such as your financial state, if you have a dependent you are paying for in college, your personal needs for retirement and so on. As previously mentioned, each state’s filial law varies widely. For instance, Arkansas only requires the child to pay for their parent’s mental health care. In Connecticut, adult children are only responsible for paying for parents who are 65 or younger. Nevada only enforces the filial responsibility law if there is a written promise to pay for the parent by the child. Pennsylvania is the only state on the list that currently enforces the law aggressively. In one such case in Pennsylvania, a son was on the hook for $92,943 in unpaid nursing home bills accumulated from his ailing mother. The nursing home sued the son when the mother left the country and moved to Greece, leaving her nursing home bills behind. According to Kedavislaw.com, the case went on for several years. Mr. Pittas initially won in arbitration in 2008, however, the nursing home appealed to a Pennsylvania state court. The judge ruled in the nursing facilities favor. The appellate panel requested that Mr. Pittas pay the facility the amount due. The supreme court denied Mr. Pittas appeal and the court entered its final judgement against Mr. Pittas in 2011. This is an extreme case of the filial responsibility law in action. Although these filial laws vary from state to state, in general, the following is what you need to know if this law may apply to you. Remember, you should always seek legal advice from an attorney to help you properly assess your situation. Your parent is accepting financial support from the state government. Your parent has a medical or nursing home bill, acquired in the state which has a filial responsibility law, which they cannot pay. Your parent is considered indigent, meaning the cost of their care is exceeding their Social Security benefits. Your parent does not qualify for Medicaid, which would typically be used to cover such expenses. The caregiver has reason to believe the patient’s child has the money to pay the bill and chooses to sue the child for what is owed (you must prove that you do not have the ability to pay). If the parent has not abandoned the child when they were a minor for a period of years (varies by state). If you are sued and a court of law holds you accountable for the bills, you risk stiff penalties for not paying them; including possible jail time. In some states, judges have the discretion to garnish your wages or place a lien on any property you own in an attempt to collect the money. Having either of those things happen to you will result in your credit rating being lowered. The positive news is that judges also have the discretion over deciding to enforce filial responsibility laws. As mentioned above, most states are very lenient with these laws and may not fully enforce them, if at all. If you can demonstrate that you do not have the financial means to pay for your parent’s bills, the court system is generally not inclined to impoverish you by making you responsible for them. Additionally, if you can show that you have significant family expenses you are dealing with otherwise, such as medical bills of your own, or college tuition for your dependent, a judge may exempt you from having to pay your parent’s debts as well. Finally, if you can demonstrate that your parent abused or abandoned you as a child, the law typically considers that individual to be undeserving of your support. Some states do require a certain number of years of abandonment prior to age 18 in order for the abandonment rule to apply. If you live in one of the states mentioned and fear that you may be sued under filial responsibility laws, your best course of action is to seek out an elder care attorney in your state for further advice. Alternately, you may wish to consult with an elder care attorney to discuss estate planning if you would like to put a strategy in place to make sure your parent will be provided for in the event they need long term care (such as nursing home care or assisted living) or in-home caregiving in the future. What Are the Costs of Caring for Aging Parents? There are many costs associated with caring for a senior parent. Whether your aging parent requires in-home care or an assisted living facility, the bills can stack up fast. The cost for a typical nursing home in the United States ranges between $5,000 and $9,000 a month. Even if your parent has Medicare, they do not traditionally cover assisted living costs. They may, however, cover healthcare fees associated with a skilled living facility. Do your research to see what your parent qualifies for and what exactly it will cover. If your parent plans to age in place, there are a few unexpected costs to keep in mind besides their basic care needs. You may need to make modifications to your loved one’s home to make it safer for them and remove fall hazards. Some improvements may include installing shower railings, a walk-in bathtub, getting a home security system, adding a ramp or a stair lift, and so on. You will also need to consider the monthly cost of a medical alert device to use in case of emergencies. If your loved one is living home alone, you will have peace of mind knowing that help is only a button push away. Also, if you need to bring additional caregiving help in, the average cost for an in-home caregiver is about $19 per hour. This is all in addition to the monthly maintenance and repairs on your parents’ home. It’s never too early to start planning for the care of your aging parent. The first thing you should consider is long-term care insurance. If you purchase this insurance early enough (while your parents are relatively healthy) the costs will be much more affordable, and they will be covered well into their old age. 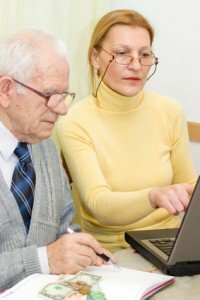 Next, you should consider the advice of an elder care attorney. They will help you decide if your loved one will qualify for Medicaid, help locate affordable senior living, help create a trust and a living will and much more. We also recommend clearly outlining roles amongst siblings for when the time comes to care for mom or dad. Write a plan for who will be the legal guardian, power of attorney, who will oversee medical decisions and so on. Finally, when your loved one is ready for caregiving, if needed, you may also consider tapping into their home equity to cover the costs of care. Taking these steps now, can help avoid worrying about the filial responsibility law in the future.